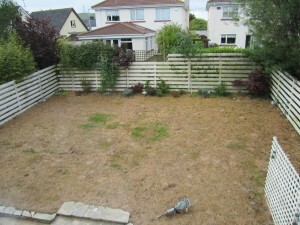 On first entering this South facing medium sized garden there was a badly laid Donegal quartz crazy paved patio, upward sloping weed infested lawn, poorly planted small beds and surrounding white timber hit and miss fence which you could see through. 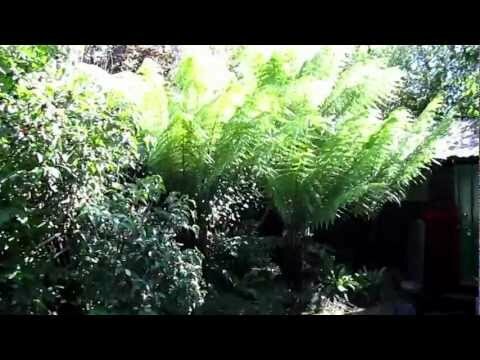 After surveying the garden and meeting with the client I came up with the following brief. 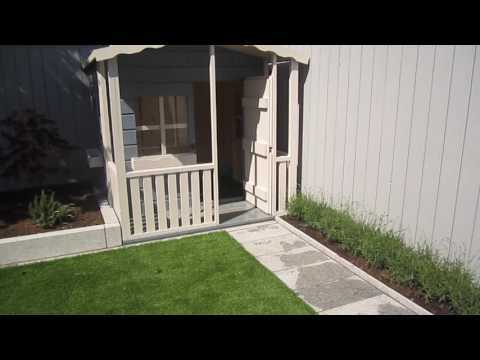 The design for this garden was very simple as the client new exactly what she wanted, it comprised of three different levels – Patio area, lawn area and raised North facing bed to the back. 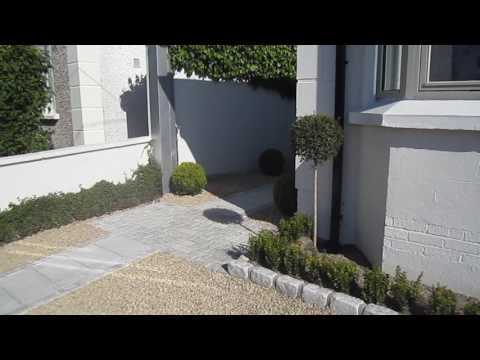 This landscaping contract was started by removing the Donegal quartz patio, surrounding hit and miss fence, the unsuitable trees, shrubs, perennials and climbers and all other unwanted materials. The whole lawn area and beds were sprayed with Roundup to kill all green vegetation. Roundup is bio active meaning it’s not bad for the environment and translocated, killing the leaves and roots of weeds out right. 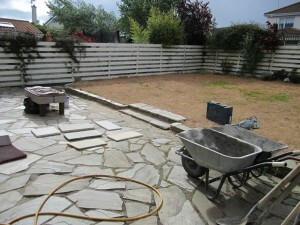 Our landscapers then started with the raised bed at the back and retaining wall in front of patio. 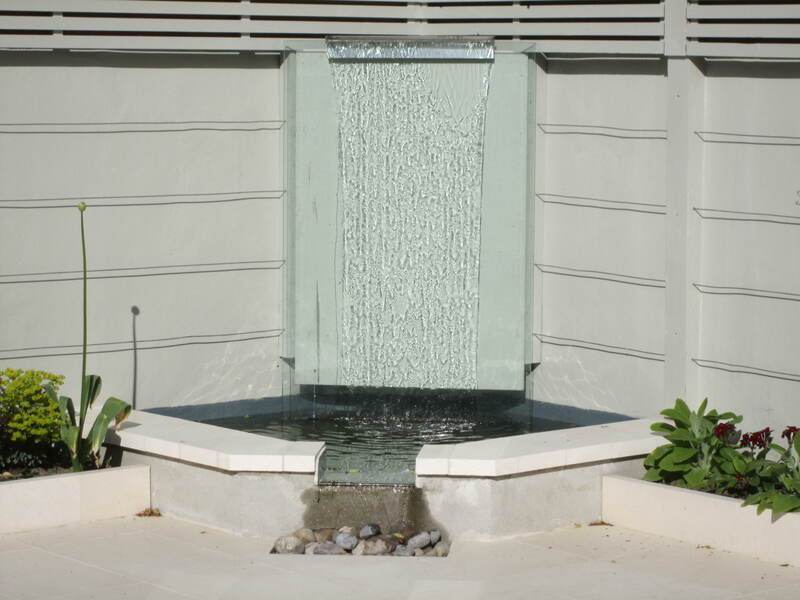 These were constructed using 4” solids to a height of 50cm, capped with silver Chinese granite, plastered with concrete render and finished with a beige coloured acrylic (Parex). 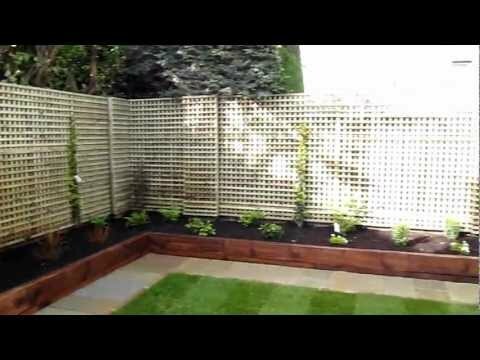 The acrylic is a good solution for raised beds and retaining walls as it will not flake or discolour from dampness after the bed and lawn were filled with topsoil. 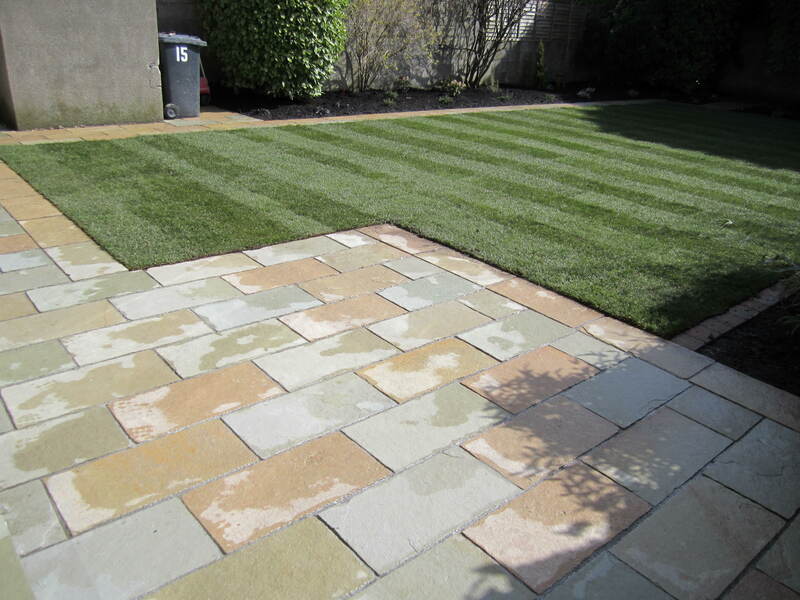 After the raised bed and lawn were filled with topsoil we installed the mowing edges using 300x300mm slabs. 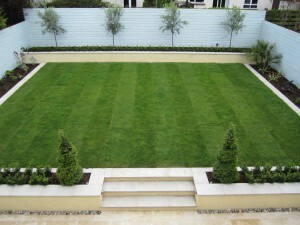 The slabs would give definition to the lawn area, create the beds and double up as small paths. The lawn was then laid using instant roll out turf. All traffic must be kept off newly laid turf for at least 3 weeks. Construction of the surrounding fence and lean too shed was next. Both were built using Scandinavian white deal weather sheeting. 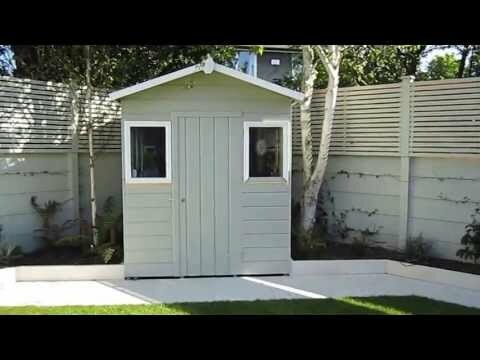 The fence and shed were painted using Dulux colortrend. 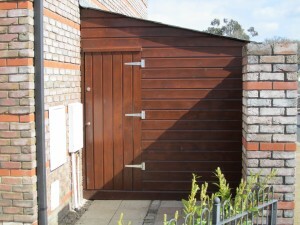 This range is specially formulated for treatment of timber and has a great selection of colours. Our landscapers then laid the Travertine Patio. We used 600×400 slabs laid on a 5:1 sand & cement mix. 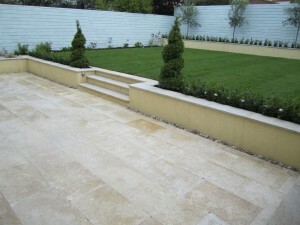 Travertine was also used on the steps leading up onto the lawn area. For drainage we installed a mole drain at the base of the retaining wall and used Wexford beach pebble of varying sizes. This simple touch made all the difference to the space providing a delightful contrast. 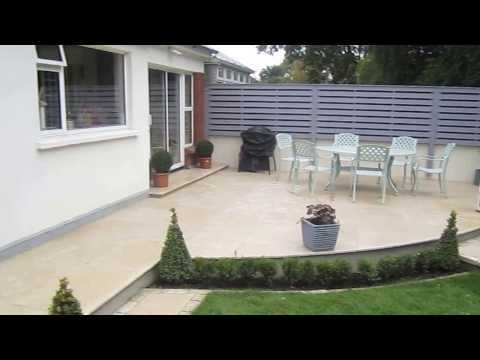 Travertine is a porous stone and must be sealed as soon as any patio is laid, if this is not done staining can occur which is impossible to remedy. Low maintenance was important for this garden and was reflected in the choice of plant specimens and in the finishing of the beds. The plants chosen included Buxus sempervirens, Olea europea, Alliums pp, Heuchera ‘Purple palace’, Nepeta faasenii, Lavandula hidcote, Rosmarinus prostrates, and Iberis sempervirens. Geotextile matting was laid around all plants and covered in 75mm of shredded bark mulch. These two layers will reduce maintenance in the garden and help the plants in stopping evaporation of water away from the soil. This project came within budget and the client was very happy with the results. If you like what you see please phone Kevin on 086 8198444.